Former WBA Interim supermiddle champ Vincent Feigenbutz (21-2) returns to action May 7 in Hamburg on the undercard to the Kubrat Pulev vs Dereck Chisora fight for the vacant EBU heavyweight title. 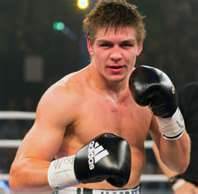 Feigenbutz (pictured above) lost the title to Davide De Carolis in January and have since left trainer Hansi Brenner and is now trained by Karsten Rover and one can imagine there´s a lot of work put down on basic boxing instead oftrying tear the head off all opponents with single shots. Also on the bill are Noel and Abel Gevor. Noel, a cruiserweight is 20-0 while Abel, a lightheavy is 11-0. Ismail Oezen, a 16-2 lightheavy based in Hamburg, is also on the bill. According to a press release from Sauerland there are 3000 tickets sold already for the show at the Barclay Arena.